​Aside from 'AGUUUUUEEEEEEERRRRRROOOOOOOOOOOOOOOOOOOO', there is no more iconic Premier League title run-in this century than the 2013/14 season. And, just like 'AGUUUUUEEEEEEERRRRRROOOOOOOOOOOOOOOOOOOO', the essence of this race can be distilled into one (slightly less euphoric) moment: Steven Gerrard's untimely slip, Demba Ba's gleeful gathering of the ball and consummate finish. But, even more so than 'AGUUUUUEEE'-well, you get it by now, a whole lot had happened before that one moment of madness/brilliance, so let's offer up a quick refresher. Because it was an utterly ridiculous, bizarre, bamboozling season. I'm going to start by telling you something unfathomable. You won't believe it, you'll want to instantly check if it's true, but I assure you it is. Ready? At the start of February, February 2nd to be precise, Arsenal, yes, ARSENAL, were top of the league. And they had been - apart from one minor blip in late January - since September 8th. September. Bloody. Eighth. Remember when Jose Mourinho (who, yes, will figure heavily in this fable) gave one of his top ten press conferences (and that's saying something) about the three horses in the title race? Remember, he mused: "The title race is between two horses and a little horse that needs milk and needs to learn how to jump. Maybe next season we can race." Well, Brendan Rodgers' Anfield Army were proudly back in fourth, pluckily holding out for a spot in the Champions League places. But all that changed the following week when the Reds - kickstarting an 11-game winning streak that would catapult them to title winners in waiting - thumped Arsene Wenger's table-toppers 5-1. Fast-forward to 27 April and - two games on from the Reds' triumphant win against Manchester City in the 'title decider' - their coronation was in sight. All that was left to do was swat aside a seriously weakened Chelsea side and their wait for a first Premier League title would be over. It has been previously mooted that it was that 'three horses' snub that Rodgers used to urge his side on in that 11-game stretch, but perhaps he should've heeded some other, less recycled words, his former mentor uttered to the press following the Blues' 1-0 win at the Etihad back in February. As quoted by ​BBC Sport, Mourinho, operating on a level of sneering smugness only he could reach, mused: "We do better in these big games because we love it. We love the big games and when you love it maybe you feel an extra motivation." It's almost like he knew what was going to happen 10 weeks before everyone else did. Because it was this goading energy, amplified by Anfield's goading hubris and Rodgers' untethered Rodgersness, that his Chelsea side tapped into on that fateful day to so devastatingly undo Liverpool. But the narratives. Oh, the narratives. The twirling, twisting narratives that have aged like the finest of vintage wines. I mean, seriously, from the Mohamed Salah factor to the Fernando Torres factor, to a timeless tale of protege vs master, to Gerrard's proclamations, to Mourinho's illness, to the slip, to the upcoming clash this weekend whereupon the two clubs will meet in the same gameweek as Man City-Crystal Palace - the very same schedule as you-know-when - you couldn't write this. It's a marvel... in fact, it's a Marvel. It's probably 'Avengers 5'. Or maybe 'The Greatest Showman 2', considering Mourinho's repeated use of the word 'circus' to describe Merseyside on that Sunday, and his emphasis that his players would not be the 'clowns'. Naturally, it being Mourinho, and in this case, probably peak Mourinho, this was not all he said. Not by a long shot. In fact, he dominated the pre-game discussion so heavily, with such pettiness and mundanity, that the Reds' aspirations were relegated to sign-offs rather than ledes. He made their title charge the afterthought, and then he destroyed it altogether. The focus was on the ensuing Champions League semi-final second leg against Atletico Madrid, he reiterated, before going off on a tirade about insufficient rest time and his enforced use of such benchwarmers as Mark Schwarzer, Tomas Kalas, ​Salah (!!!) and Demba Ba (!!!!!!). For his part, Rodgers tried to stay cool, but he was still trying to process his presence in a title race at all. He wasn't ready for the mind-game big leagues, before or after the game. So, to the game itself, one which, upon revisiting, is like watching the first 20 minutes of a horror film when you know what's coming. The suppressed smiles on the players' faces, the defiantly jubilant atmosphere, the belief - imbued by Gerrard's insistence that this historic challenge would not 'f*&kin slip now', that they'd 'go again', that they'd 'go Norwich, exactly the same', then do the same thing against Chelsea. But they couldn't. Right from the off, something felt different about this Liverpool performance. The tension was somehow elevated from that City clash, the emotion heightened... but the team's attacking might diminished. Faced with a 41-year-old Australian in goal and a 20-year-old Czech debutant in front of him, they couldn't capitalise. But wait, I forgot to mention the two additional double-decker buses, didn't I? We'll get there. It is easy to forget, though, that Gerrard's oh-so-freudian (so much so that it's now Gerrardian) slip came right at the end of the first half - we're talking 48 minutes - because, well, not much happened. ​Liverpool threatened to look threatening and Chelsea stood firm. The problem was, the midfielder was thinking the same thing. He'd skipped the part where he had to control the ball, because, why wouldn't you? That's something sheer muscle memory should be able to take care of two years into your career, let alone 15. But it didn't. 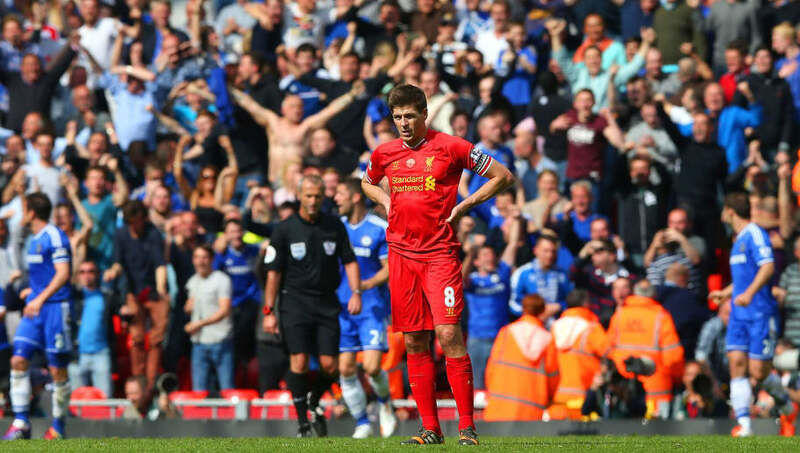 And, suddenly, Gerrard was panicking. The ball hadn't stuck to his feet like it always did, and suddenly those feet were deserting him, too. And, suddenly, Demba Ba was in. Suddenly, Demba Ba was striding towards Simon Mignolet. Suddenly, Demba Ba had coolly rolled the ball between Mignolet's legs. Suddenly, ​Chelsea were 1-0 up. Suddenly, it had slipped. The rest of the game followed a similar pattern, and the symmetry was confirmed when another club legend, Iago Aspas, gave the ball up from a corner, handing it on a plate to Willian who - well, actually, a few minutes later and from a seperate break - confirmed the result with a tap-in from a Fernando Torres assist. Game over. But not article over. Before that, we have a compulsory 'Game of Thrones' reference to drop in. The most famous Liverpool 🆚 Chelsea moment ever. Here's the thing. The tactical wheel wasn't being invented by Mourinho here, as Rodgers would bitterly spout in the post-game. The invention was all the blathering he did beforehand, and all the histrionics he performed during. Just like Ned Stark in Season One of 'GoT', Rodgers was too clouded by naivety and his beholdenness to ideology - to true attacking football - to see the trap Mourinho, the true Cersei Lannister of football, had laid for him. "When you play the game of thrones, you win, or you die. There is no middle ground."